The handmade favors may be my favorite part of the entire party. I thought for a long time about what I wanted to give the kids as a thank you for coming. With a mix of both boys and girls, it was difficult to settle on something I liked that was gender neutral. 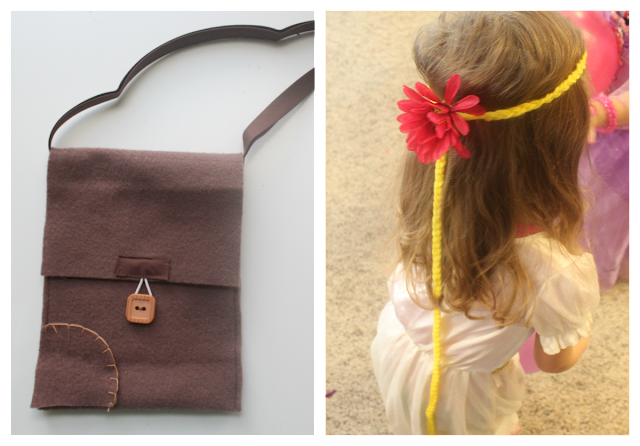 Instead, I decided to cater to both and make Rapunzel braids for the girls and Flynn Rider satchels for the boys! 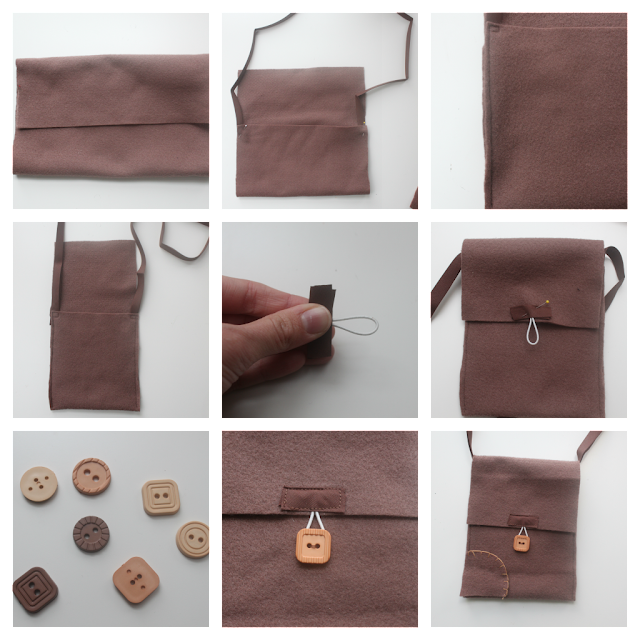 SUPPLIES: brown felt (1/4 yd is more than enough), brown bias tape, buttons, elastic cord, thread, sewing machine and supplies, glue gun. ONE: first, cut a rectangle of felt that is 16 inches long and 5 inches wide. Also cut 30 inches of bias tape for the strap. TWO: fold the bottom of your felt rectangle up 6 inches and sandwich the end of your bias tape under each side. Pin to secure. THREE: sew a straight line from the bottom of your bag to the top. When you reach the top, lift your presser foot and turn the bag, then sew a few stitches across and down to secure your bias tape. Repeat on the other side. FOUR: your bag should look like this so far! FIVE: for your closure, cut a piece of bias tape several inches long, and sandwich the ends of a loop of elastic cording 3 inches long inside. SIX: pin your bias tape and cording to your bag and stitch around the perimeter to. Backstitch a few times when you reach the elastic to make sure it's secure. SEVEN: (essential to making sure the satchel doesn't look like a purse!) pick out a button for the bag. You want something with a "boy-ish" feel to it. I found these awesome buttons in my stash and they were perfect for this bag. EIGHT: hand stitch your button on. 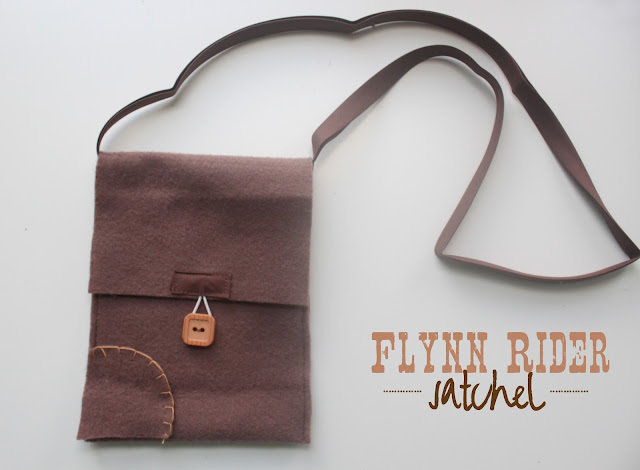 NINE: Flynn Rider's bag has a small scrap on the bottom with hand stitching. To make this, cut a small piece of felt and use a needle and contrasting thread to make a blanket stitch around the side (learn how to make a blanket stitch HERE.) Hot glue the scrap to your satchel. SUPPLIES: yellow yarn, thin purple ribbon, packing tape, hot glue, fake flowers. 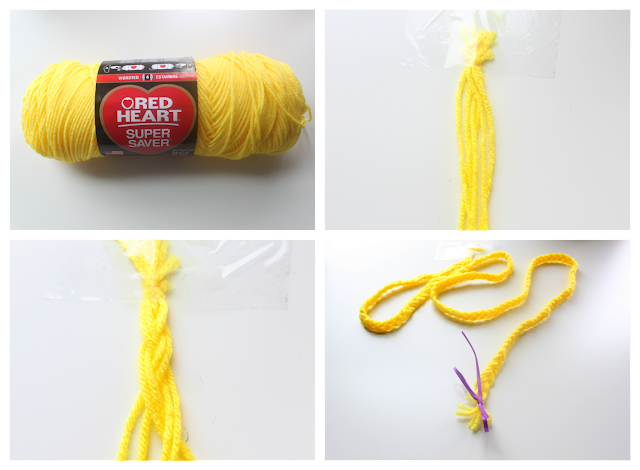 ONE: I found this golden yellow thread at Walmart. One package was enough to make 10 braids with a TON of yarn left over. TWO: cut 6 strands of yarn about 36 inches long. tie an overhand knot at one of the ends and tape to a table or other surface. 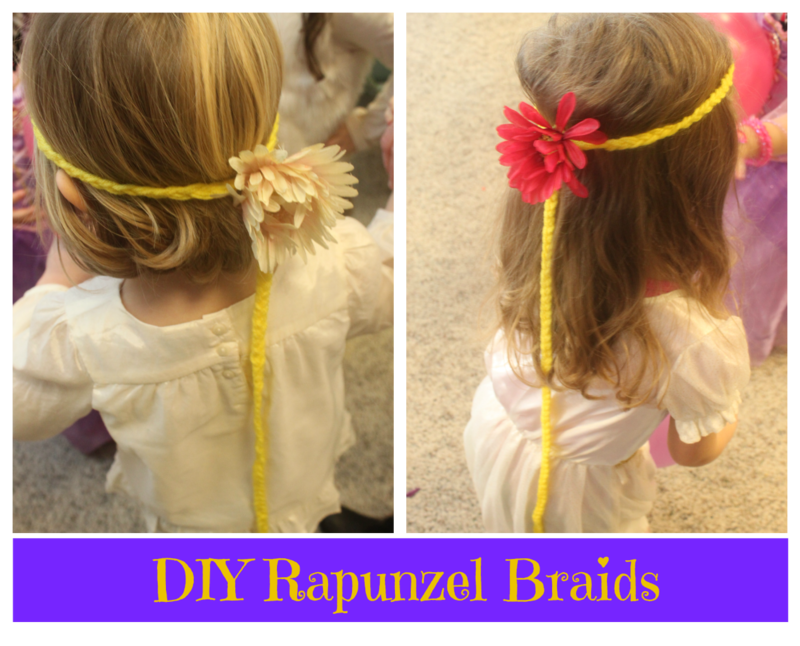 THREE: separate 2 strands each and braid until you reach the end. FOUR: using your purple ribbon, tie a bow around the end. I love this! My daughter just got into Tangled. It is such a great movie! I just looked through all the Tangled party post. Sigh. Love. It is times like this that I wish I had a girl!!! Great job.